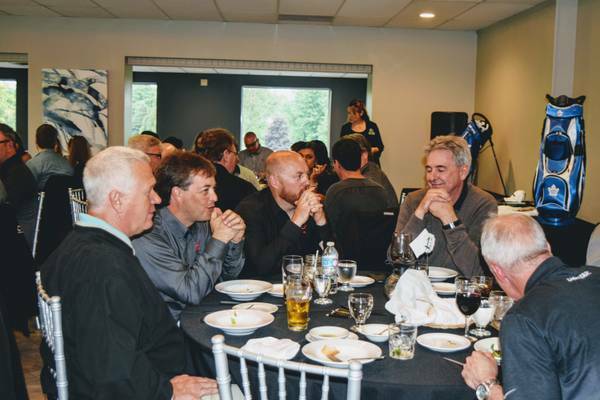 Hamilton, Ontario – June 23, 2017 -- Axalta and CARSTAR joined together to host its first ever Nine and Dine, an event that includes nine holes of golf and a dinner. Nine and Dine took place at Southbrook Golf and Country Club in Hamilton, Ontario. CARSTAR is celebrating its 20 anniversary of partnership with Cystic Fibrosis Canada. During this time, over $3 million has been raised for its charity of choice. Nine and Dine contributed to this running total with a $4,000 donation to the organization. Although stormy weather took the “nine” out of “nine and dine,” attendees enjoyed an evening of food, networking and charity. Raffle events took over the evening with exciting items like gift cards, golf bags and golf apparel getting auctioned off. Almost all of the attendees bought into a 50/50 raffle, which saw a total jackpot of $1,000. The Nine and Dine event brought over 100 key industry leaders together to engage in some substantial networking and community building, while also raising valuable funds for Cystic Fibrosis Canada. Along with Axalta, Norton, Napa, Cmax, Rondex and LKQ sponsored the event. These companies donated prizes and funds for the event. Southbrook Golf and Country Club provided a beautiful steak dinner for all attendees to enjoy. CARSTAR and Axalta would like to thank everyone who made it out to the event and contributed to Cystic Fibrosis Canada.